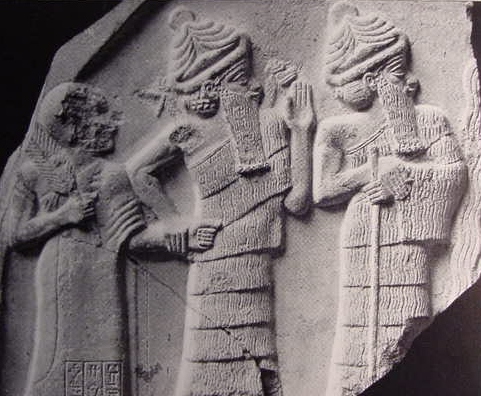 My research suggests that the Serpent in the Garden of Eden is a later fusion and recast by the Hebrews of several gods from different Mesopotamian myths; but principally: Ea (Enki), Anu (An), Dumuzi (Tammuz) and Ningishzida (Gizzida) from the Adapa and the Southwind myth. Please click here for all the details. Please click here for another picture of Ningishzida and Gudaea from a cylinder seal, which shows Ningishzida not only in humanform but also as a walking winged and double-horned serpent-dragon.